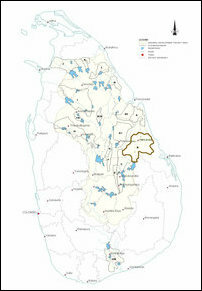 Under Mahinda Rajapaksa’s regime, it was Colombo's SL Forest Department, engineering the demographic genocide of big-scale land grab of pasturelands and converting the pasturelands in Batticaloa into Sinhala colonies. But now, SL President Maithiripala Sirisena’s so-called Mahaweli ‘Development’ Ministry is spearheading the structural genocide against Eezham Tamil dairy farmers by stepping up the Sinhala colonisation in 2016 with more than 1,000 hectares of forest and pasture lands, deploying retired Sinhala military men, armed ‘home guards’ paramilitary, Sinhalese traders from the South, Buddhist monks and poor Sinhala daily-wage labourers, says the secretary of Dairy Farmers Association in Kiraan and Chengka'ladi, Mr Nimalan Kanthasamy, who was interviewed by TamilNet this week. More than 1,000 cows, owned by Eezham Tamil dairy farmers have been shot and killed within the last 3 years. The process has accelerated after Sirisena coming to power with Tamil votes according to the US designs. Obviously, the modus operandi is in the model of ‘Yankee Cowboys’ seizing Red Indian lands, commented political observers in the East. Kanthasamy continues to list the destruction, as 500 cows sustaining injuries and another 45 being taken away within the last three years by the armed men, who operate with the backing of retired SL military personnel, Buddhist monks and the Governor of the Eastern Province, who is an advisor to SL President on so-called reconciliation. The Sinhala colonial governor is sitting on the repeated promises extended by the SL Government Agent and the Deputy Inspector General of SL Police in the district, according Mr Kanthasamy. 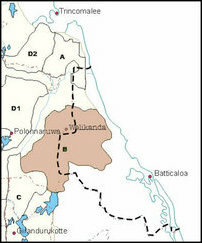 The structural genocide of appropriating the lands within the Batticaloa district started after the end of the genocidal war on Eezham Tamils living in the LTTE-controlled areas in Batticaloa. Following repeated protests and complaints, the Tamil dairy farmers decided to wage a continued struggle by boycotting milk supplies to SL government-owned Milco company in May. The milk supplies from Batticaloa district constitute 22% of the milk consumption in the entire island, says Mr Kanthasamy. But, the explanation from Milco was that it has nothing to do with the encroachments and that it was only engaging in a commercial relationship with the farmers. The SL State-owned corporation was buying the milk at lower rate from Tamils than from the ‘Government fixed’ rate in the South, he further complained. However, due to the repeated protests the SL Government Agent and various other administrative officials were forced to visit the area and inspect the situation in May 2016. The officials, including the GA and the SL Police officials, agreed that the settlements were illegal and sent their reports to SL Governor in the East, Kalupage Austin Fernando, who was a former Defence Secretary of Colombo during the previous UNP regime. There has been no action from the Governor’s office so far, the Tamil farmers from Kiraan complain. The SL Government officials initially promised an answer before 26 May, but we are reaching 26 September. Nothing has happened, they say. According to Mr Kanthasamy, there is a clear intention on the part of occupying Sinhalese to deprive Tamil farmers from accessing the pasturelands. In the meantime, the SL Forest Department was involved in filing lawsuits with false charges against Tamil cattle herders in 2010. Still the Forest Department officials are demanding the farmers to plead guilty in order to relieve them from continuing their cases with the SL Judiciary. “Why should we plead guilty for crimes that we didn't commit while they are the ones who commit crimes against us,” asks Kanthasamy. The SL Police at Ea’raavoor has also not acted against the encroaching culprits who had gunned down the cattle belonging to Tamil farmers. “Even when the farmers had supplied photographic evidence of the killers and the incidents, there was no action by the SL police,” Mr Kanthasamy said. Despite the repeated complaints and agitations, a Buddhist temple has been constructed and several Sinhalese, who have encroached into the area are about to seize more lands now. They are converting the forest land and even the rocky lands for cultivation, after adding layers of agriculture soil using the poverty stricken workers brought from the South. These lands are not fit for agriculture, but their real intention is something else, Mr Kanthasamy says. The intruders also engage in several illegal activities, he says. Hailing from Polonnaruwa, Mr Sirisena has been implementing a long-term Sinhalicisiation agenda within the so-called System B, which is the largest of Mahaweli ‘Development’ programme, consisting of 75,441 ha., including 27,179 ha of irrigable lands in Polonnaruwa and Batticaloa districts under the pretext of ‘development’. Foreign countries are standing in queue to help his structural genocide with the approval and participation of the ultra big powers seeking geostrategic inroads into the island, the political observers in the East further commented.